The tropical onion (Allium cepa) forms a single, rounded bulb with no offsets and usually is propagated by sets or seeds. These onions are short- to medium-day length types, which produce bulbs during the short days of winter through spring. With careful soil preparation and good timing, you can grow a healthy crop of tropical onions in just a few months. 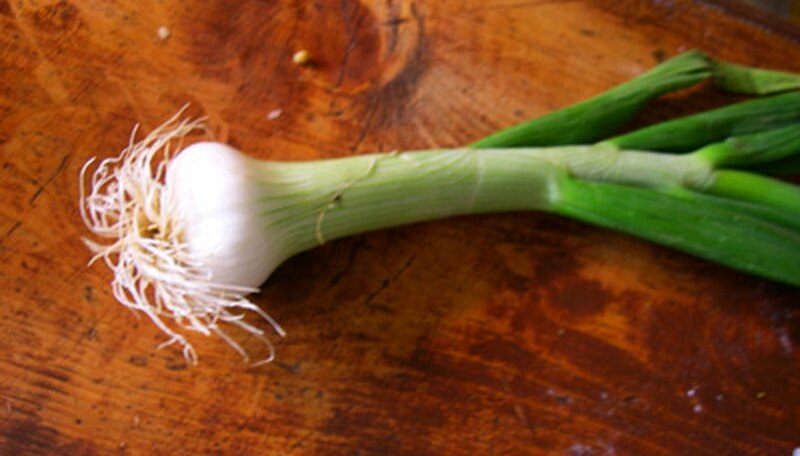 Onion sets produce ripe bulbs in 90 to 120 days, and seeds mature in about 160 days. A little attention to detail can yield tasty homegrown onions, even in the tropics. Select firm, healthy tropical onion bulbs about the diameter of a dime, or buy seeds. Plant short-day length onions between September 1 and March 15. Plant intermediate- or medium-day length onions from March 15 through May 31. Avoid long-day length cultivars because they will not form bulbs in the tropics under natural light. Plant the onion sets at least 8 inches apart and twice as deep as the height of the bulb, or about 1 inch deep. Cover the sets and tamp the soil well. Sow seeds thinly in rows and cover them with a 1/2 inch of fine organic compost. Firm the soil gently over the seeds. Water the bed well at planting time just enough to evenly moisten the soil evenly. Irrigate the onions regularly as they grow to prevent the developing bulbs from shriveling or cracking. Thin the seedlings to about 6 inches apart when they are 3 inches tall. Good short-day length varieties include yellow granex 33, yellow granex hybrid, Texas grano 502, red creole and awahia. Good intermediate-day length cultivars include San Joaquin, pronto S and early harvest. Watch for aphids, thrips and onion moth caterpillars. Control these by using insecticidal soap or by hand picking. Stop watering when the foliage falls over, which is an indication that the bulbs are fully formed. Store newly dug bulbs with the leaves left on them in a dry, shady place for a few days so they will cure.